In this past year we have seen the start of the next phase of G-d sifting the Wheat and the Chaff. Too long I have stated that Joel 3 is going to be a game changer for non believers and believers alike. Therefore the decision will effect someone’s salvation in G-d with one simple Question: “Are You For Israel and G-d’s People, or Against?”. This one decision has now come in to the Political realm and will very much effect the nation it’s leaders choose to decide upon. This decision as you may have guessed is whether to recognise Palestine or not. Clearly it cannot be a simple middle ground answer as to many that want a 2 state/nation option. It is very clear that G-d gave Israel to his people the Jews and there cannot be a position against or in the middle. It is a decision that is now facing everyone from all walks of life, no matter if you believe in G-d or not this will not go away by simply getting on with life or answering “Why can’t we all just get along”. So I will put this as an update list of which nations are going to effect and cause much danger to their nation, if they do not Repent. I know for sure the 4th (Top) is the final scene. At the expense of forgetting the order I weighed the decision to share this so as not to have blood on my hands when so much in the world is going on, and much of this prophecy is actually coming to pass as we speak and many prophecies and visions I’ve read all predict a Russian Invasion of USA and possibly 1 or many Nuke’s going off. The vision was pretty much self explanatory, with no audio. I hope you can share this and pass it on. Whether you think I am a doomsday freak, false prophet, not of G-d or what have you, I stand by what the vision I got, and I will go to judgement and say I only told them what I saw I did not claim to be anything or anyone. Hi I have a few questions for you and the company. 2. If so, how does this happen when you are a Seventh Day Adventist Company? this is the standard instruction given to all believers in Jesus, so why get mixed up in Non Christian beliefs and ways of the world? My unfortunate stance now is boycotting anything HALAL and warning people not to eat or drink anything to do with HALAL, it is also a racketeering operation where your funds are now being used by the Halal certification company to go towards Jihad and support Terrorism. The Trans Pacific Partnership deal is another secret round table discussion happening at the moment between most of the pacific region and Americas. WikiLeaks is responsible for helping leak a few chapters on the reality of this agreement, which is yet to be totally agreed apon by its participators. This huge power grab by Corporations and Elite is unprecedented in modern history as this agreement will affect many areas of business and not for the good. Who comes out on top? Government, big pharma, Monsanto, and multi-billion dollar corporations, which already influence the New World Order that is being set up. Smaller businesses will be forced to comply or end up being in trouble. It will cause medication to sky rocket, it will stop our countries sovereignty and also block our countries from making our own laws, because they would have signed this agreement binding their proverbial hands together and letting Global Government dictate business. One such thing which will come in to effect would be the ability for multi-billion dollar businesses or governments to sue other governments even though they should not be a legal entity to sue as Government is supposed to be a non-trade or commercial entity. So I say TPPA NO WAY! This will be another nail in a countries sovereignty coffin, and a rise in Global Government. I believe that in these times we the people can still make a difference and take action by signing petitions, making submissions, talking to local council members and or MP’s (Or your respective representatives depending which country you are in) and get active. I read this and this ties in with the prophecy pinned to the blog and twitter page. 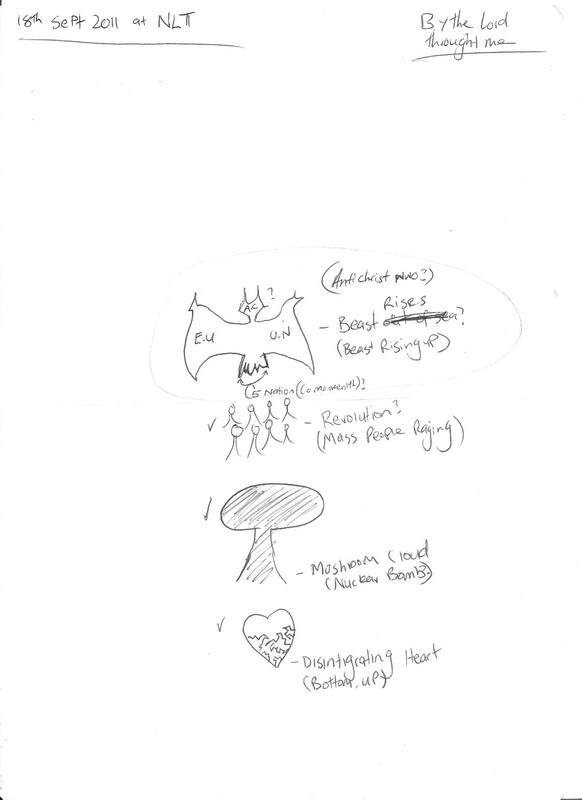 (World Falling Apart, Riots, Nuclear Fallout, Beast Rising). “I sent Bob an email; and got a reply. “We need to talk.” So I called him. and take the spoil for herself. nation or die! The IDF women were also in the thick of the battles. up in front of his throne in Heaven, and declared, “I RULE; NOT YOU! being trampled to death. Store are robbed or sold out of everything. Mob riots and looting prevail. ethnic (nation) against ethnic (nation). shall I answer your prayer. an indescribable PULSING LIGHT! And however, it happens, ISRAEL WINS! enemy’s blood flows in torrents. ISRAEL WON! The Father speaks from Heaven..” BY MY NAME, I AM THAT WHO I AM! source of our deliverance; if we will receive that deliverance. “Citizen Four” opened at select theaters across New Zealand Thursday 12th February. As a bias activist against “Big Brother” I fully anticipated this movie. Edward Snowden did a righteous thing in the face of Slanderous charges by the State. My full support and love goes to him and his partner off the grid in Russia. While I will only divulge one snippet paraphrased quote as best as I can remember from the movie, to set the tone it is the same motto I have for this ministry: “I am not the story, as much as I have done It is about the documents (Classified documents about NSA…”. Citizen Four is a great thriller, set in a secret room where Snowden reaches out to the audience through his courage and resolve. This movie is a must for any critics, bias and deniers to understand what is going on without the rabble of internet trolls, main stream media rhetoric, distractors or so called debunkers. You get to hear it from the horses mouth of Edward who worked for the NSA. Citizen Four certainly delivers and deserves an oscar and even best documentary of the year in any category. I highly recommend seeing it and buying the film when available. Go to http://www.citizenfour.com to see how you can protect yourself from Govt and Big Brother. Hi I have been an activist against Monsanto for some time but also concerned that it is a product your selling in your store, and maybe also nationwide? also Monsanto is known to lie to the public and is known to control most of the farming culture around the world with it’s GMO seeds, and sues any farmer if they decide to opt out or if Monsanto’s “Patented” crops/seeds spread on to other farmers land. They are bullies and I would recommend cancelling anything from this company. I hope you can make yourself aware of this, and other stores. If you do not agree then at least i have let you know about this information and hope you can consider it. I really am looking out for my fellow New Zealanders and those companies I believe in. Another Step Closer to Psalm 83…. The Syrian rebel militia Al Yarmouk Shuhada Brigades, backed and trained for two years by US officers, mostly CIA experts, in Jordan, and supported by the Israeli army, has abruptly dumped these sponsors and joined up with the Islamic State in Iraq and Syria, DEBKAfile’s exclusive military and counter-terrorism sources reveal. 1. The Yarmouk Brigades are strung out along Israel’s Golan border with Syria, from the UN peacekeepers camp opposite Kibbutz Ein Zivan (see map) in the north, down to the Israeli-Syrian-Jordanian border junction in the south. The Brigades therefore sit along 45 of the total 76 kilometers of the Syrian-Israeli border. 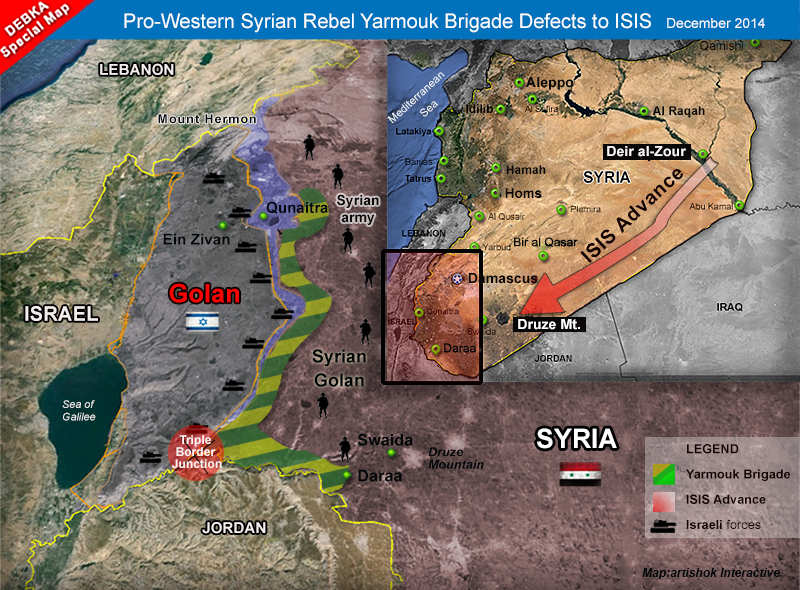 This means that a long stretch of Israel’s Golan border with Syria has fallen under the control of the Islamic State. BREAKING: EU Decide’s two Anti-Israel processes in one day! In a prideful decision, the EU has made two Anti-Israel decisions in one day. 1st it removed HAMAS from it’s Terrorist list, and secondly voted in favour of a Palestine State. Showing it’s prideful behaviour against the one true G-d. Sadly this also decides the fate of the Govt’s member States as they have all signed a Covenant/Contract with the EU.giving sovereignity and power to the EU. It is also known that it is very difficult to cancel or get out of the EU or UN, obviously G-d is bigger if a nation decides to truely repent. But the question is will any Repent? I pray they do, otherwise all these nations listed here: http://tinyurl.com/najrz5w will be going in to Judgement. We have just passed another prophetic warning sign and road sign, G-d’s plans are in motion and by this one it looks like we will most likely see Joel 3, Psalm 83, Ezekiel 38-39 very soon.